So, I found this Westone guitar at Value Village for $14.99 cad. I had no clue what a Westone was, but I figured every guitar has to be worth more than $15. So I picked it up, brought it home to clean up, and realized there was paint coming off. Someone had painted this thing an ungodly teal colour. I assumed that any body who did this, probably wouldn't have taken the clear off, so I could probably just take it back to the original colour. 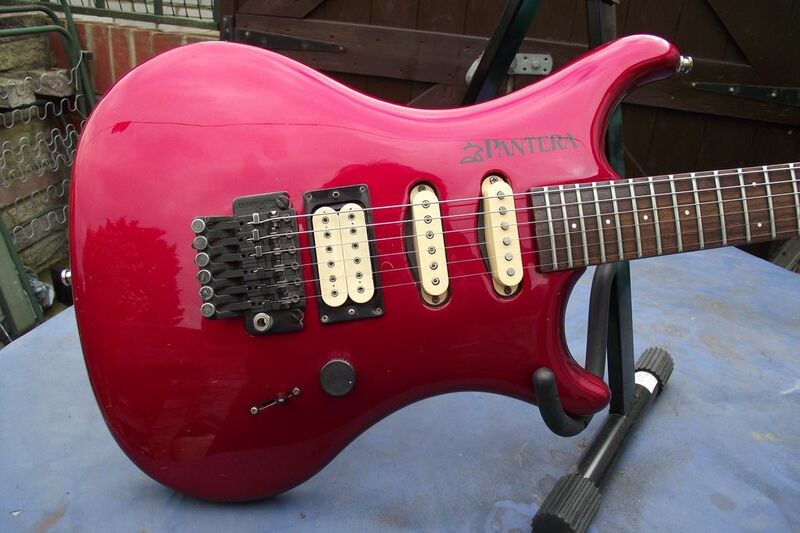 I was sanding through the real, and found the Pantera logo above the neck pickup, with a candy red paint job. Then I found silver with the end of the logo, which was actually over top of another Pantera logo. I'm not sure my picture will explain this, but it looks like it has had multiple factory paint jobs. I'm assuming the silver was just the base coat under the candy red, but that doesn't explain the two (maybe three) logos that weren't aligned with each other. 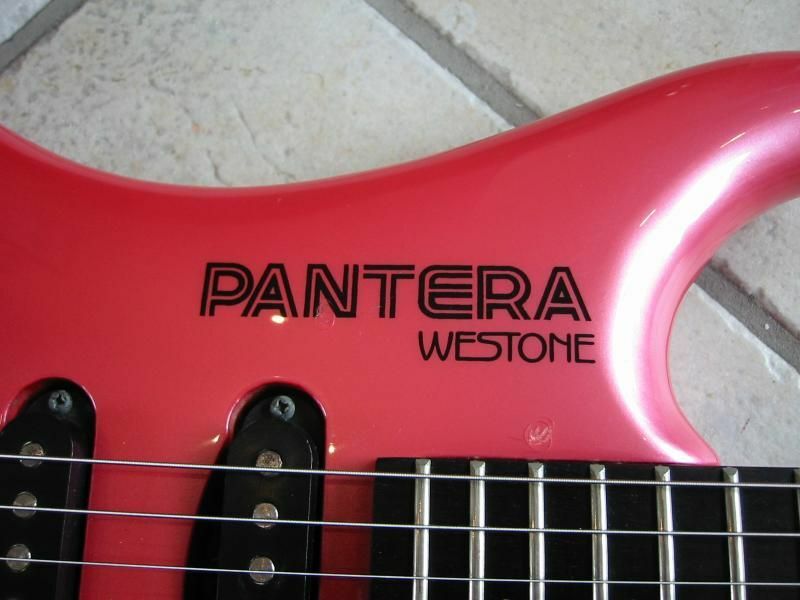 Also, do they noramally say "Westone" under the Pantera logo on the 1986 models? here's a picture of what I am talking about. Thats the early Pantera logo. You more than likely have a Bendmaster FT trem. was changed to a Bendmaster Deluxe later on. And the later type logo. Here's a CR later model with changed pups. F*ing Fantastic! What a score! 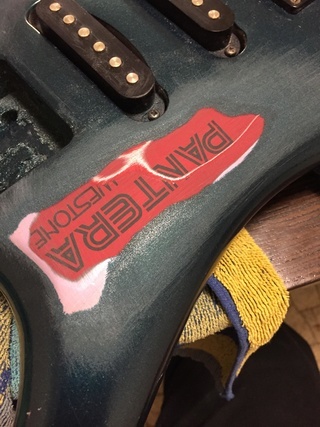 See if you can get that black crap off without destroying the original finish. You've got a gem under that stuff. That's the plan. I was really hoping they hadn't removed the clear, but I don't even know how they were finished originally. 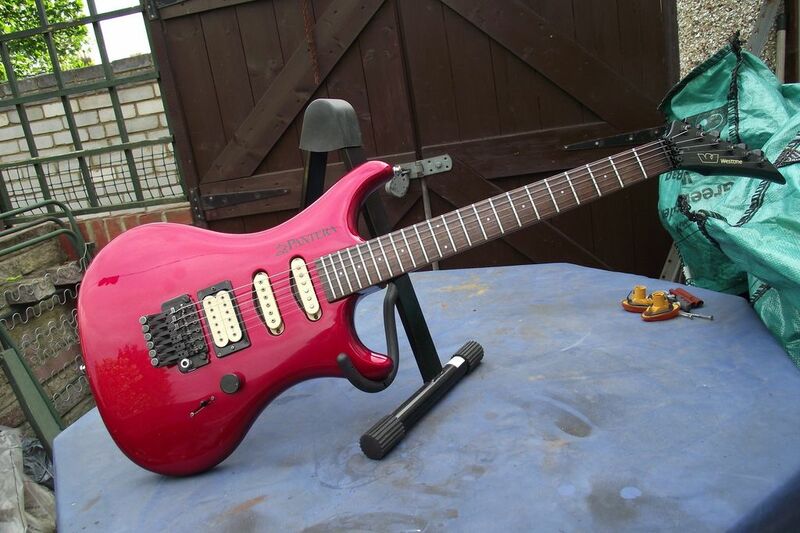 Mats guitars normally a used catalyzed polyurethane finish, very tough stuff. If the black is a rattle can spray job you might be better off using a solvent or very weak paint remover rather than sand paper. A gentle heat source might also lift it. You want to try to do as little damage as possible then buff it all back to a nice shine.But if you do end up having to repaint it's not the end of the world. You still have an amazing guitar for peanuts! 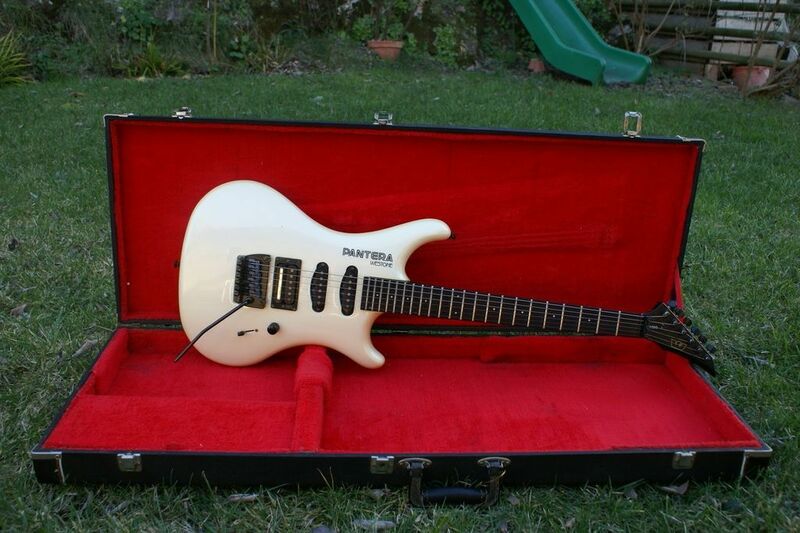 yeah, I knew that's how most were finished, but I wasn't too sure about Japanese guitars in the 80's. It was actually painted decently, in a dark shimmery teal colour, but they never got around to putting clear on it. I'm pretty sure it is an automotive paint or something. I was hoping to be able to save the original paint so that I could keep the logo on there, but it might be tricky. that's the funny part I was talking about originally. I went through the logo once, but it's actually on there twice in two separate layers for some reason. Looks like it might have been pink at some time.